I have been slow about booking my travel along the way this trip, and this time it kinda bit me, but that turned out to be a silver lining that may have led to the best part of this trip so far. Prices for airfare and rentals for my next stop had jumped, so I changed my travel plans to stay in Melbourne(ish) a little longer and check out an event I had bookmarked. 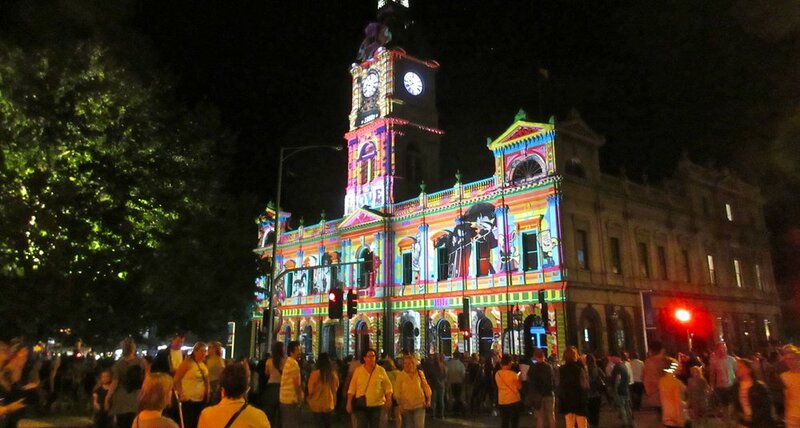 Last night was White Night in Ballarat, a smaller city about an hour train ride from Melbourne that actually kinda reminds me of a more progressive version of my hometown in Virginia. White Night is a late night art experience with projection mapping on buildings, performers, and installations throughout their downtown area. (Locals laugh when I call it a downtown - they prefer "Central Business District.") It lasts until 3am and lots of restaurants and businesses stay open for it, along with plenty of food trucks and vendors. Since its an experience, photos don't necessarily do it justice, but if you catch the "stories" on my instagram account, those clips give a better idea. Only one of the projection mappings was animated, and I could have watched it all night. (Note to any similar festival organizers: I would absolutely love to create a projection mapped video…just sayin.) 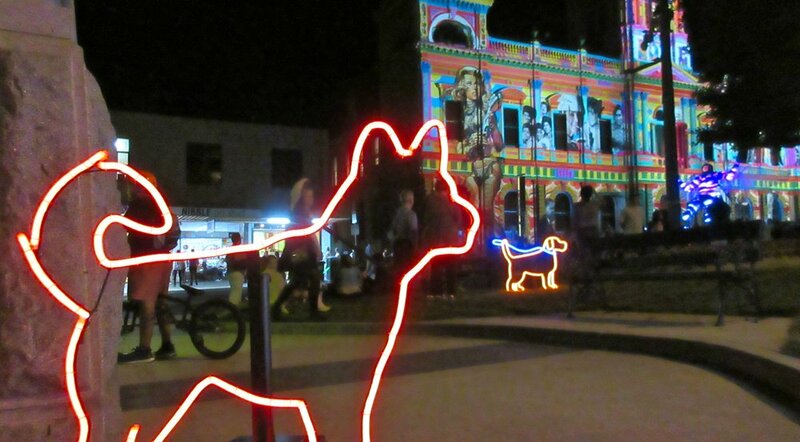 My favorite part, though, was a bit of a given - the neon dog park. After feeling a bit lost in Melbourne, the side trip to Ballarat turned out to be a welcome and lucky diversion.